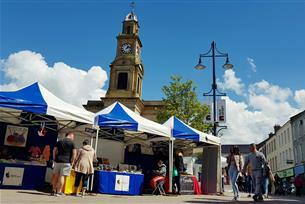 The Causeway Speciality Market is a bustling, speciality food and craft market held in Coleraine Town Centre – located around the Town Hall, a magnificent 150-year old sandstone building in the Diamond area of the town centre - on the second Saturday of each month from 09:00 - 16:00. In operation since 2006, the Market has gone from strength to strength and has established itself as the largest regular outdoor market in Northern Ireland with over 50 stalls. For almost 13 years the Causeway Speciality Market has attracted large visitor numbers from all over Northern Ireland to Coleraine. Shoppers can enjoy browsing arts and crafts whether for that unique gift or a treat for yourself as the traders at the Causeway Market provide a superb selection of quality crafts including handmade jewellery, textile crafts, ceramics, framed photography, scented candles and soaps, painted glassware and polished wood-turned products. Also visit the array of food stalls with many award winning artisan products; meats including goat, venison, pork & bacon, buffalo, Dexter beef and local chorizo; fish both fresh and smoked; curry sauces; oils; relishes; olives; fresh pasta; sheep’s cheese; jams; chutneys; speciality teas, coffees, artisan breads and local vegetables. For those with a sweet tooth you will not be disappointed with a wide variety of treats available; cakes, cookies, muffins, meringues, cupcakes, tray-bakes, fudge and sticky toffee puddings. All created by the stallholders themselves. You cannot get more ‘shop local’ than that!